Have you ever seen an ad for an upcoming game or app, but forgotten about it by the time it gets released? Problem solved – Google Play will now let you pre-register for apps. You just search for the app you know is coming then click the ‘pre-register’ button to get a notification when it’s available. 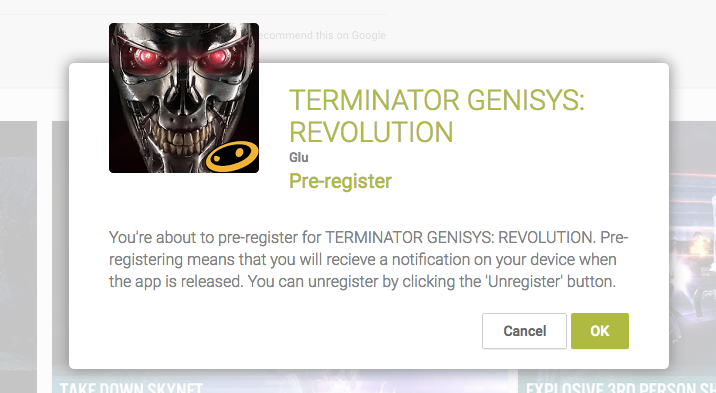 The new Terminator Genisys: Revolution game is the first title to utilize the new feature, as reported by Android Police. Pre-registration doesn’t mean that you are obliged to buy or even download the app. It’s just a notification system. We contacted Google for further information on the feature, but have not yet received a response. With no release date for Terminator Genisys: Revolution and no indication of when the feature will be rolled out elsewhere, it’s just a waiting game for now.